July 27, 2013 July 16, 2018 - 16 Comments. There are parts of the Midwest (the Milwaukee and St. Louis areas in particular) in which Bierce’s definition of custard would be considered sacrilege. Midwesterners feel so strongly about their custard, that an utterance of such blasphemy would be an occasion for a noose, a tall tree and a short drop. Their passion for frozen custard is akin to the love New Mexicans have for chile and never mind that winter temperatures throughout the Midwest can drop to near Arctic levels, custard is an year-round obsession. The Sterns appreciate only the best custard—“dense and smooth, not as rich as ice cream, but even more luxurious.” In their sagacious estimation, the very best frozen custard in America is found at the legendary Ted Drewes, a Saint Louis institution for nearly eight decades. Despite copious cajoling by custard aficionados to franchise, Ted Drewes will not compromise on quality and remains a two store operation in Saint Louis. Albuquerque native Kurt Nilson attended a Saint Louis area university where he discovered and fell in love with the premium frozen custard at Ted Drewes. Before moving back to the Duke City, he completed courses at the Frozen Dessert Institute so that he could bring one of his favorite parts of the Midwest back to his beloved high mountain desert home. He figured frozen custard would be perfect for those scalding Burque summer days. Nilson launched Chillz in June, 2009, the height of the summer’s blistering onslaught. Situated directly across Central Avenue from the University of New Mexico, it’s two doors down from Walker’s Popcorn Company, another favorite of Midwest transplants who may have frequented Garrett’s Popcorn, a Chicago staple. In 2012, Nilson sold his interest in the shop he founded to his partner, an affable Minnesotan well acquainted with custard. Though nearly eighty years behind Ted Drewes in experience, Chillz has actually two-upped the elder statesman of frozen custard by offering three flavors every day to Drewes’ one flavor (vanilla). Chillz features a flavor of the day in addition to chocolate and vanilla. The flavors of the day are inventive and exciting. Chillz has even taken to creating ballots on which customers can vote for the flavor of the day they’d next like to see. You can cast a vote for up to five choices on each ballot. The menu, scrawled on the wall, includes more than thirty toppings–from the unusual (gummy bears, cinnamon toast crunch, Lucky Charms) to the standards (hot fudge, toffee, Oreos). There are some things you should know about frozen custard–the real stuff, the stuff Chillz makes and serves. Sure, it may look like ice cream, but there are vast differences. First, eggs are added to make frozen custard–1.4 percent egg yolk, in fact. Second, it is much lower in butterfat content than conventional ice cream: ten percent compared to sixteen percent. Through a churning process, the custard is blended with air to increase its volume, but it not nearly as airy as the franchised soft-serve ice cream served throughout New Mexico. Frozen custard isn’t churned as long as ice cream and isn’t nearly as cold. The result is a thicker and creamier texture than ice cream as well as a softer consistency. 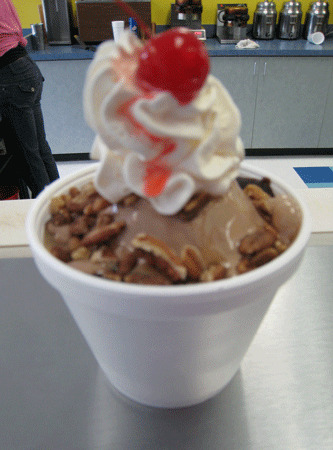 Chillz makes its frozen custard fresh every day as well as its waffle bowls and cones. The menu also includes sundaes, shakes, floats, baked treats (cookies, Rice Krispy treats and brownies) and something which, at first browse, might sound unappetizing, but is quite good–concretes. In his phenomenal blog, Barry Popik describes concretes as “custard blended with any of dozens of ingredients. Concretes are blended so thick that they and their spoon do not fall out when their cup is turned upside down; servers often demonstrate this before handing customers their order.” If this description sounds familiar, you’ve probably had a Blizzard shake at Dairy Queen which is made with the soft-serve ice cream and not real frozen custard. Real frozen custard–Chillz custard–is exquisite. It’s as smooth as a baby’s bottom with an amazing taste and texture. The chocolate has a rich, indulgent and expensive taste (but at a reasonable price). The raspberries provide a tangy yet surprisingly complementary contrast to the sweet (but not cloying), creamy, oh-so-good custard. This custard is so good you’ll want at least a couple of scoops; some will want even more. For them, Chillz has a gurgitator’s challenge few will surmount. The Chillz Challenge: eight scoops, eight waffles, eight toppings in thirty minutes and your frozen feast is free. You’ll also get your photo prominently displayed on Chillz’ wall of fame, Web site, Facebook and MySpace sites. The current record-holder is Stephanie Torres, a petite dynamo who completed the Chillz Challenge in just over eight minutes. I’m easily twice her size and couldn’t approach her eating feat on my best day. As of July 28, 2013, some fifteen competitors have surmounted the challenge for which, to date, no UNM athlete has manned or womaned up. Neither did Man Versus Food star Adam Richman who didn’t include Chillz on his itinerary when he visited the Duke City in 2010. Richman who doesn’t ever eat ice cream or ice cream-like products during the “off season” (when he’s not taping his show). In fact, he finds sweet challenges the most difficult, particularly when they involve rich, dairy product. Much as I love custard, it’s challenge enough to polish off a turtle sundae and it’s only got two scoops of the sinfully rich custard. My turtle sundae, made with one scoop of the exquisite chocolate and one scoop of the flavor of the day for June 26th, key lime, was wonderful, an exemplary rendition of the popular dessert. The key lime makes for an unconventional turtle sundae, but other ingredients (hot fudge, toasted pecans, whipped cream) are right out of the recipe book for sundaes. Chillz has an excellent rendition of a banana split. It’s pretty much a standard banana split only it’s made with custard instead of ice cream. If the flavor of the day happens to be fudge caramel eclair, it makes an outstanding foundation for the strawberry, chocolate fudge and pineapple toppings. Chocolate custard, on the other hand, is a terrific foil for the S’mores: marshmallow, hot fudge, graham cracker, whipped cream and a cherry. It’s wonderful! In July, 2013, Andrea Feucht, author of the must have Food Lover’s Guide to Santa Fe, Albuquerque and Taos wrote an article for The Guardian, one of the largest daily British newspapers, in which she named the top ten restaurants, cafes and diners in Albuquerque. Andrea, a Wisconsin native, thinks so highly of Chillz that it made her hallowed list. In recent years, the influx of Midwesterners has added much to the Duke City dining scene. From the aforementioned Walker’s Popcorn Company to Pizza 9 (home of sloppy and sumptuous Chicago style Italian beef sandwiches) and now Chillz, Albuquerque may not yet compete with Chicago, but then the Windy City doesn’t have anything like our chile. They don’t have Chillz either. We do, and for that, Duke City diners will be grateful every time the mercury approaches the century mark and every day it doesn’t. At any time of year Chillz is a great destination. The nice thing about Culver’s is that they send a friendly email out daily with their latest flavor offerings. It takes a lot of the decision making away from the diner. I’d go for something like pinons, chile and raspberry. I should *finally* follow up on my “threat” to have an Elvis concrete. I did in fact do just that, about a year ago. I went to Mannie’s and got an order of extra crispy bacon to go. Got a few eyebrows for that. Anyway, then I headed over to Chillz and ate half the bacon (there was a lot!) and then handed the rest to Kurt and asked for a concrete with banana, peanut butter, and my bacon. And yeah, it was awesome. What other weirdo toppings could we bring in to make interesting sundaes? Chile? Chillz is the best place for frozen treats in town. I hear they could use a bit of a boost in this tough economy, so please tell your friends to stop in for a terrific, high-quality delight. Staff is amazing, custard and all toppings…amazing. atmosphere is fun. If you havent been, you need to get in today! Great job Chillz! Custard is great. Staff…not so much. Ive learned to accept it. I always have to wait for someone to come from the back to help me. Maybe get a service bell?? Male staff is short and cold when i try to make friendly conversation. Guess u have a sacrifice in every situation. KURT!!!! This is fantastic! So glad to see you’re bringing St. Louis home with you! Sounds like your business is really workin’ it. Congrats! Ok, the Elvis Concrete is in the cards – either today or tomorrow, depending on how soon a I get back post-lunch appetite…. Feel free to bring your own bacon! You never know if it makes something really fantastic it may find a way to join my ever growing list of toppings! Kurt, if you add bacon to your topping list I will hightail it down there and make the ELVIS concrete: peanut butter, banana, bacon. Maybe I’ll just bring my own bacon. Hmm. Woo hoo! When I was there I had the “all shook up”, which has peanut butter cookie & banana. And then to further my sugar rush I had one of the ice cream sandwiches with those oatmeal cookies. Yum. Andrea- We do have concretes! Come try one out and let me know how you think we stack up! I am not claiming to out do Ted….he is a frozen custard legend and has about 90 years of experience on me, but we will do our best to work to continue to improve and reach his level! Any suggestions anyone has as to how we can improve the way we serve you would be greatly appreciated! It’s not Ted Drews on either Watson or S. Grand but it is the closest thing to St. Louis I have ever found for frozen custard……………..Keep going! I love this place, and hope they do well, so they can stick around for a long, long time. So far my favourite things are the Birthday Cake custard (made, I’m told, with real buttercream icing, and sold on, *I think* the last Tuesday of every month), and the “custard ‘n’ waffle.” In my case, vanilla custard a top a fresh-made, miniature Belgian waffle and adorned with raspberries. Heaven.